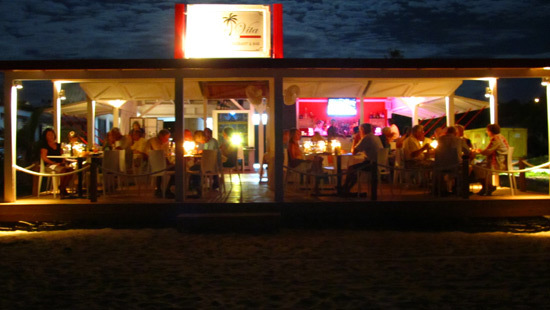 Set on funky, lively Sandy Ground, Dolce Vita has a faster-paced, bustling type of atmosphere. 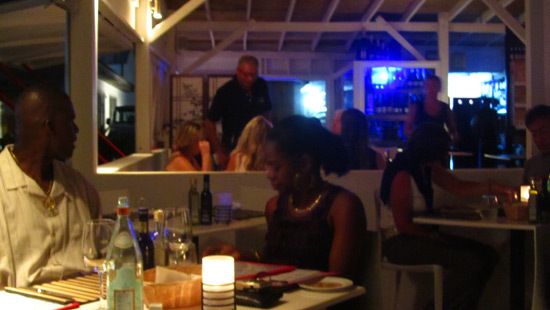 Fun, and with Abbi as your gracious host, Dolce Vita is a cool, trendy spot for an excellent Italian meal. 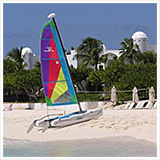 Anguilla is world-famous for its five-star cuisine. 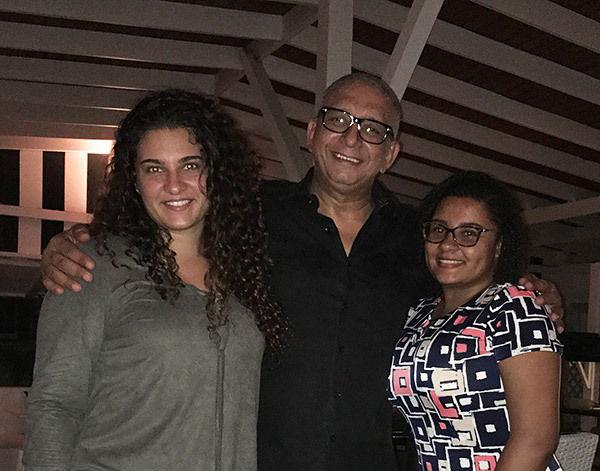 Its restaurants are in the league of the Nobu's and Cipriani's of the world, except you enjoy your meal while sitting by the Caribbean Sea. Of course, those meals often come at five-star prices, too. But, you don't have to pay $300-$400 (for four people) for outstanding dining by the shore. 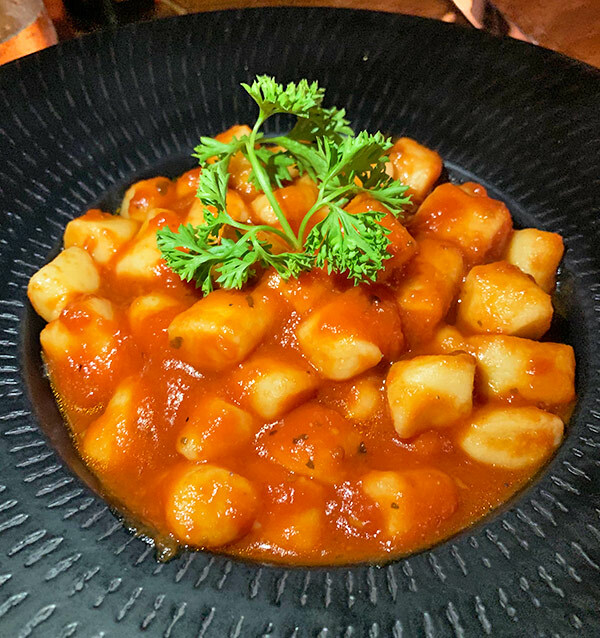 One restaurant that gets rave reviews over and over is Dolce Vita. 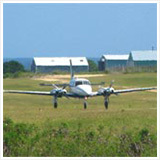 "Excellent Italian, comfortable dining, affordable price, and right on the beach at Sandy Ground." 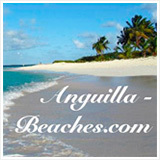 It is no secret that the beaches of Anguilla are most breathtaking when the sun is shining at its brightest. When the sun goes down, though? 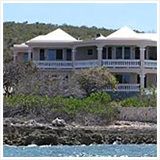 The water view shouldn't be slept on, and Dolce Vita has a front row view! The still waters depict a shiny, reflective, rippled floor to the horizon in the distance. The fading sunlight, the coming moonlight and lights from yachts glisten atop the water in total companionship, as smaller fishing boats come in to moor around the harbor. All of this can be seen from the comfort of your dining table in the oh so sweet, Dolce Vita restaurant. 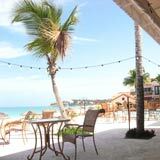 The restaurant itself is a white-washed casual wooden building, set right on Sandy Ground's shores. 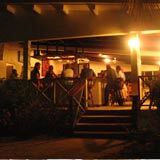 The restaurant exudes a trendy-cool vibe, with friendly service and a tastefully colored and lit-up bar that keep locals and visitors coming back. With such a buzz inside, it's no surprise that every table is always taken! Inside, there are two dining areas... inside and out on the deck. 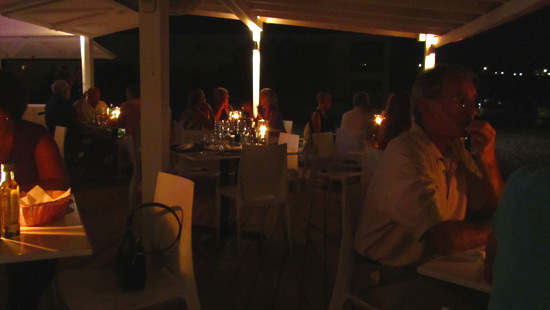 Tip: Make reservations ahead, and request a table on the edge of the deck, closest to the sea. 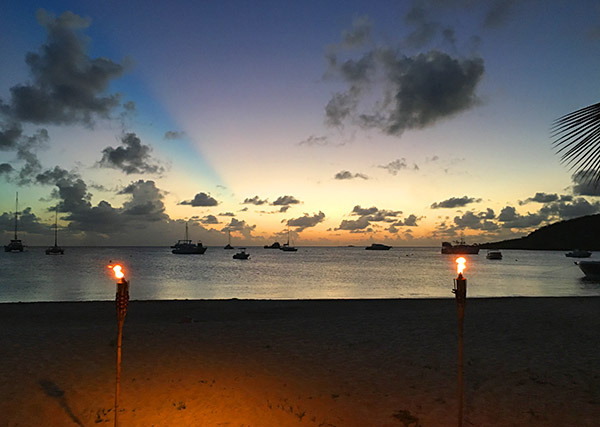 The view of Sandy Ground's sailboats lit up against the night sky gives you the best of both worlds... tranquility straight ahead, and the chatter of the lively, popular restaurant inside. From the moment you step foot inside Dolce Vita, you are made to feel right at home. From the warm and welcoming owner, Abbi, to the kind waitresses who impress with how they remember all of the specials from memory. The entire Dolce Vita team is exceptional. 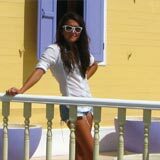 Abbi Ibraham owns and runs Dolce Vita. 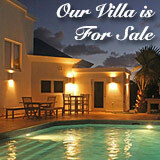 He is the former manager of the old Luna Rosa Italian restaurant in Anguilla. Abbi has been in the Italian restaurant business for many years. 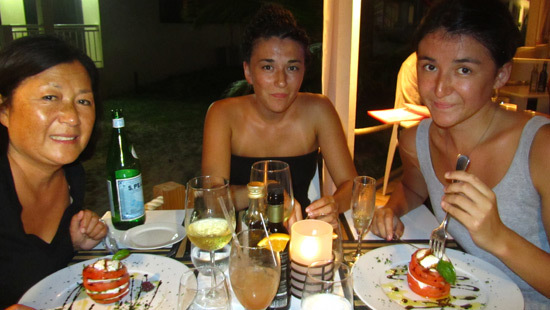 Chef Christopher Bacchiega joined Abbi in Anguilla when Abbi decided to embark on his own venture. 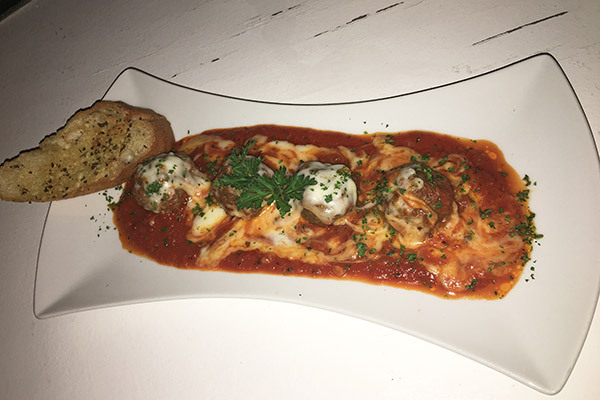 Chef's creations, and the menu, is authentic Italian, with an Anguilla twist, taking advantage of the island's natural ingredients... seafood. The meal begins with Le Bon Pain's freshly baked bread served with Dolce Vita's 'Aceto Balsamico' (Balsamic oil) and olive oil. While fully indulging in this crispy, savory treat, it's hard not to stare out into the waters, soaking in every bit of this sweet life at Dolce Vita. The feeling of peace overpowers you as gentle soft jazz blends in so seamlessly with the passionate conversations that surround you. 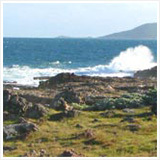 The cheerful night breeze and calming waves folding on the shoreline highlight this Sandy Ground gem. For starters, the Caprese di Bufola, Carpacio di Tommo o Pescoe Spada, and Calamari Fritti are light ways to begin the meal. Yuki and Mom recommend the fresh Caprese salad (they ask to hold the olives and pesto sauce). The most highly recommended appetizer? 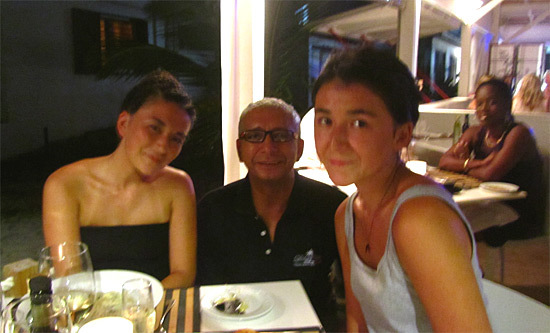 Dad says their Swordfish Carpacio is the best carpacio he's ever tasted. 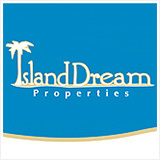 And not only is it delicious, you can't get it anywhere else on the island! Our friend, Louise swears by the Polpette all Parmigiana. Fat, juicy meatballs are bathed in tomato sauce and baked with melted mozzarella cheese. It is a heartwarming dish. 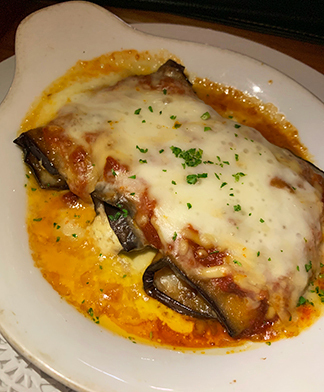 Soft and thin slices of eggplant with covered in cheese and tomato sauce. 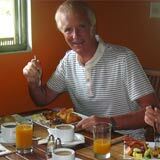 An 'egg-cellent' choice for a vegetarian! Yet another vegetarian-friendly favorite starter? The "Gnocchi Alla Gorgonzola." came out and it was the size of a main! It is so hard to believe it is a starter! The serving size is almost the size of a main. As for taste? These gnocchis are pillowy pieces of heaven, resting in a rich tomato sauce. 100% yum! 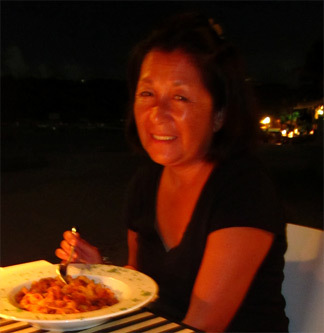 My parents adore the pasta, and it's Louise's favorite part of the menu. Chef Christopher does the "classics" well. Everything from bolognese to ravioli with ricotta and spinach are on the menu. The ravioli is especially tangy, tossed in a butter and fresh sage sauce. Each pasta dish is flavorful and al dente, just the way we like it. The combination of homemade pasta, homemade pasta sauce and seafood cannot be beat. Another menu favorite for Dad is the pesto, and he's normally very hard to please when it comes to pesto-based pasta. My Dad has also been won over by the spaghetti with shrimp, scallops and mussels on several occasions. 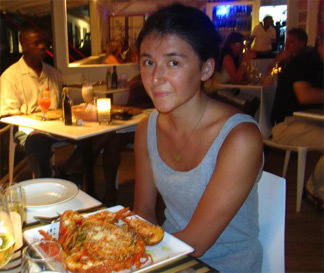 Our friend Louise loves the seafood pastas, too. 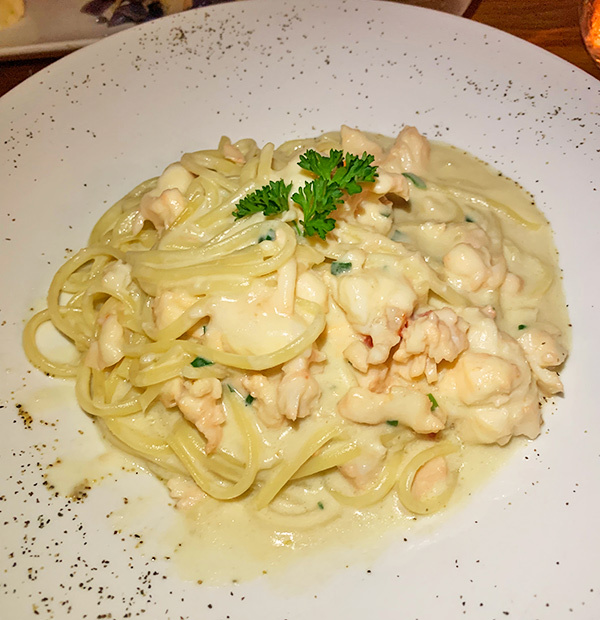 The Seafood Gamberoni Fra Diabolo is a favorite. 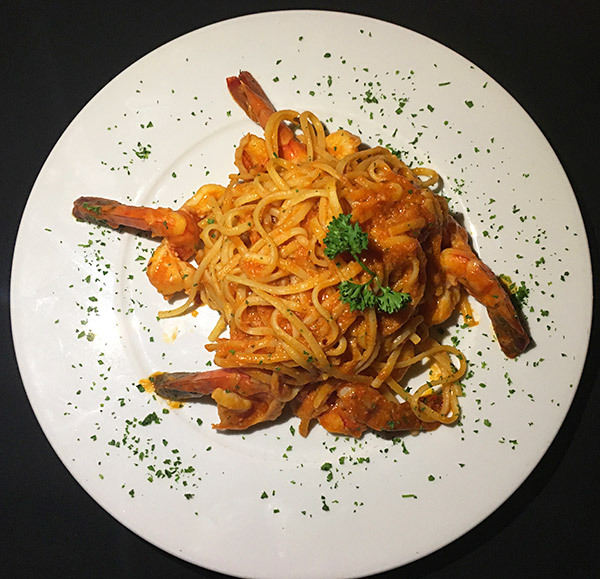 Linguine with large prawns are sautéed in a garlicky, spicy tomato sauce with white wine and then dusted with fresh basil and parsley. Molto delizioso! Huge chunks of lobster are tossed in a cream sauce with spaghetti and parsley. Rich in seafoody-creamy flavor and texture, each bite is better than the next. 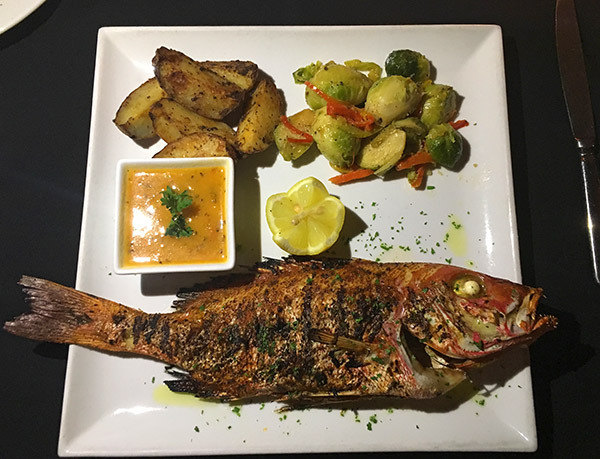 When it comes to seafood dishes, Chef Christopher impresses yet again. 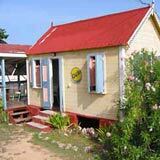 For the price in Anguilla, these dishes are hard to beat. After (or during) your meal, Abbi soon arrives at your table, personally ensuring that you have enjoyed your meal, and the evening on the whole. Abbi is a wonderful man, with a warm personality. He is passionate about his business, you can tell by the sparkle in his eye. He is a man who loves what he does! Louise & Cassie with Owner Abbi... We Love You, Abbi! 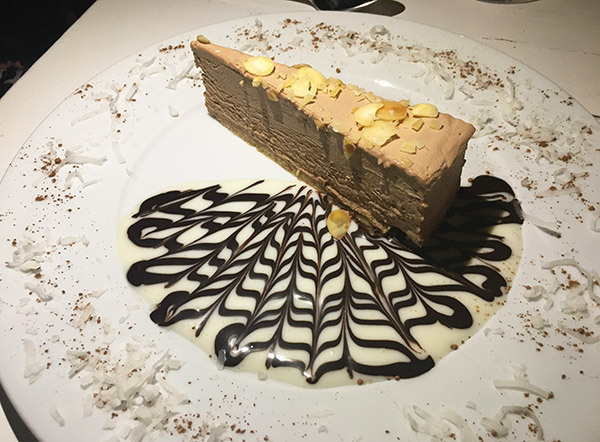 By the time we reach "dolce" (desserts) we are normally ready to burst... yet still, creamy cheese cake, tiramisu, chocolate mousse and Italian ice cream with amaretto cookies call your name. More than satisfied and stomachs running on full, the dessert menu is simply too tempting. One dessert or another will get you! The Nutella Cheesecake is especially memorable. Made with cream cheese, ricotta, mascarpone and Nutella, this dreamy dessert is served with a rich coconut sauce. Spongy, smooth and syrupy, it is also a work of visual art. “How did the chef get the sauce to spiral like that?” Our friend Louise asked. 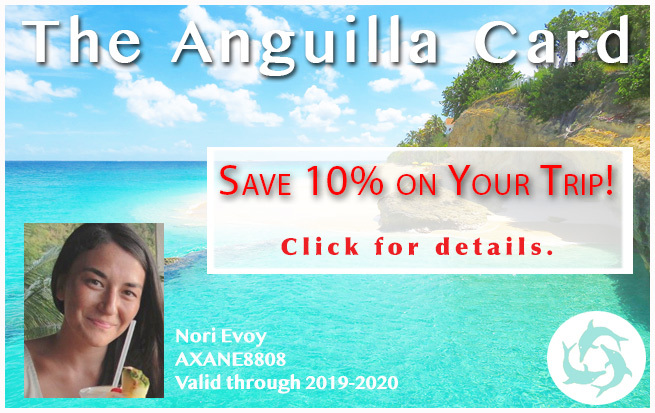 With drinks, wine, appetizers, entrees and dessert, and considering the superb service, setting and location, the bill is extremely reasonable (especially by Anguilla standards!). A popular restaurant here on our little rock, Dolce Vita has a first in class reputation for good reason. Abbi is one of the kindest souls you will meet. He and his team go above and beyond each and every night. For creating meaningful memories with the ones you cherish the most, Dolce Vita is a top choice. 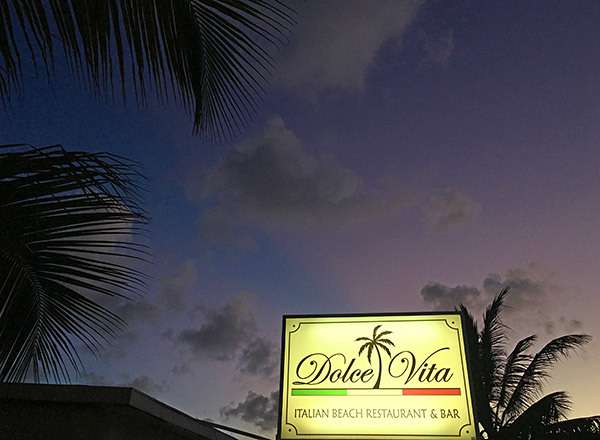 If you are in the mood for a place with a trendy vibe, enjoy people watching, great food and hospitality right on the sea, and all without breaking the bank... visit Dolce Vita. 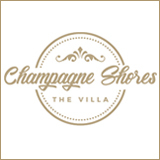 Directions: Dolce Vita is located on the Sandy Ground "strip", before you reach Pumphouse and Johnno's, if you're coming from the south/don't pass Elvis' on your way into Sandy Ground. Good for a more busy type of atmosphere and a night of fine Italian food. Note: With Dolce Vita has joined Sandy Ground's collection of nice restaurants, including Roy's Bayside Grill, Barrel Stay, Ripples, SandBar and Pumphouse.